Our Towing are reliable, fast, honest and reasonable. We have been serving Philadelphia since 2006. We have flat truck bed services and wheel lifts to tow any car, van or truck. When an accident happens, our trained staff and large fleet of tow trucks can handle any type of situation. We can guarantee towing at reasonable rates. As one of the largest towing companies in Philadelphia, we can handle all of your needs when you want to transport any car. tools to handle your vehicles with the utmost care. 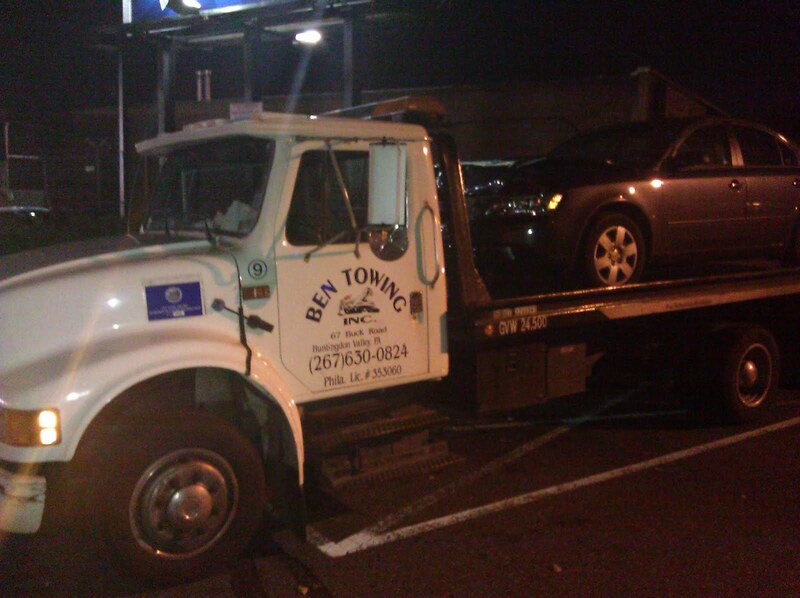 Ben Towing has delivered high value vehicles all over the Philadelphia area. We are proud of our towing safety records. Our goal is to provide Philadelphia Metro customers with reliable and fast service 24/7. Our rates are low and reasonable. We strive to get to you in no longer then 20 to 30 minutes. Ben Towing has been servicing Philadelphia Metro since 2006. Our professional, helpful, and friendly staff will walk you through out the whole process. We are FULLY LICENSED and INSURED. Please call us for pricing.